A family film with an inspirational message that presents its story through a unique, modern production style. GET READY FOR THE SUMO BOWL! There has never been a football team like the Portland Lobsters. There will never be one again! Quarterback Caleb O’Rourke is fantastic, but The Lobsters’ front line is terrible. O’Rourke can’t get a pass off… ever. 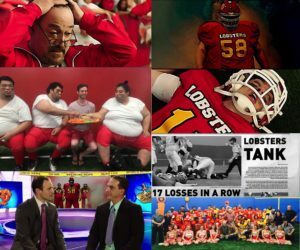 In an act of total desperation, the coach of The Lobsters, a pro football team that has now lost 32 games in a row, travels to Japan to buy a school of sumo wrestlers. His intention? To bring the humongous wrestlers back to Maine to replace his inept offensive line. Hail Mary! is unusually produced with a combination of hilarious live action and uniquely developed BRUSH-STROKED ANIMATION. The football sequences were filmed on green-screen and back-dropped into the Buffalo Bills Ralph Wilson Stadium, Sumo cheerleaders and all! “[Hail Mary!] presents a total departure from the current crop of motion pictures. It relies heavily on strong visuals and a distinctive visual style. Simply put, the story-line is exceptionally funny with huge commercial potential.” – Rob Draper, Cinematographer (Halloween 5, Spitfire Grill). “A killer idea here. First, it’s fun, crazy, fantastical energy. It reminds me a bit of ‘Shaolin Soccer’, which I loved. This world isn’t constrained by the rules that govern ours. Their sports prowess is so great as to transcend the boundaries of physics…love the wild energy and the image of the sumo wrestlers on the football field…”– Colin Theys, Film Director “The Murder Pact”, “Alien Opponent”. The DVD version includes bonus material including a teaser for the upcoming Comic Book Series, the original movie trailer and an audio file of The Acorn Song, a traditional Japanese classic that includes on-screen lyrics. 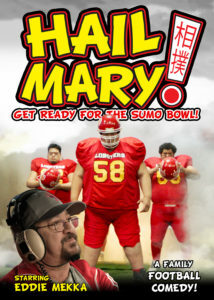 Of special note for trivia enthusiasts: Based on market research, the title Hail Mary! replaced the original film title which of Sushi Tushi. 2018 / 90 Minutes / Color / 16×9 / 5.1 Surround Sound / A film by Ziad H Hamzeh. Hail Mary! 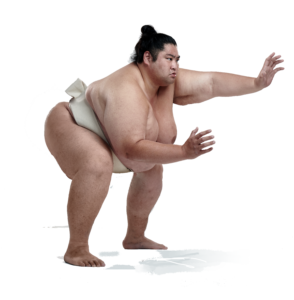 Get Ready for the Sumo Bowl! from Sushi Tushi on Vimeo.